SPI, CAN, I2C, UART and Logic decoders. 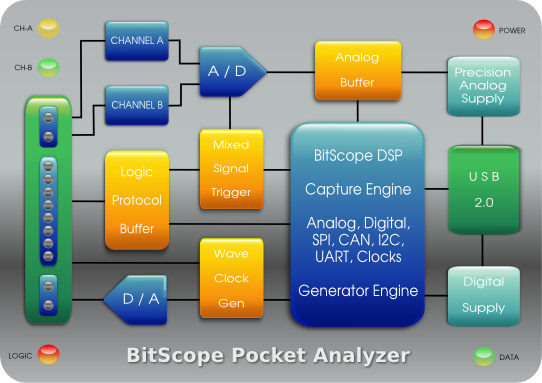 We call it BitScope Pocket Analyzer. It's a problem solver that fits in the palm of your hand. Pocket Analyzer provides both 5V & 3.3V, I/O & clock signals so it can power, control and even clock logic or microcontroller circuits! What you won't need are oscilloscopes, logic analyzers, waveform generators, power supplies or spectrum analyzers because that's what BitScope provides via it's Smart POD Interface. Pocket Analyzer is very fast with a frame rate up to 100 Hz driving a digital phosphor display. It works like a quality stand-alone mixed signal scope. View waveforms, plots, spectra and more on its smooth flowing real-time display. Even live captured logic data can be viewed this way. Pocket Analyzer is far more than just a logic protocol analyzer; it's a fully featured portable oscilloscope, spectrum analyzer, waveform generator, power supply and logic analyzer in a compact USB powered unit. It has multi-range analog channels with adjustable input offsets, level adjustable logic comparators for two of its eight logic channels and it's compatible with the dual channel active differential probe making possible differential measurements not otherwise possible, especially in such a compact instrument. 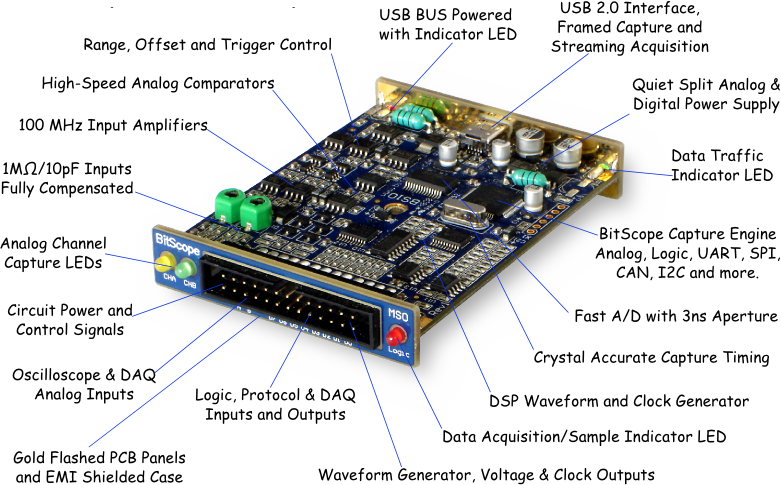 BitScope BS10U merges mixed signal capture and generation with protocol analysis. Working in concert with the BitScope software applications on the host computer, Pocket Analyzer's signal acquisition, processing and sythesis components operate together to implement a wide range of test and measurement instruments many of which can operate at the same time. One of the simplest and probably most useful test instruments. 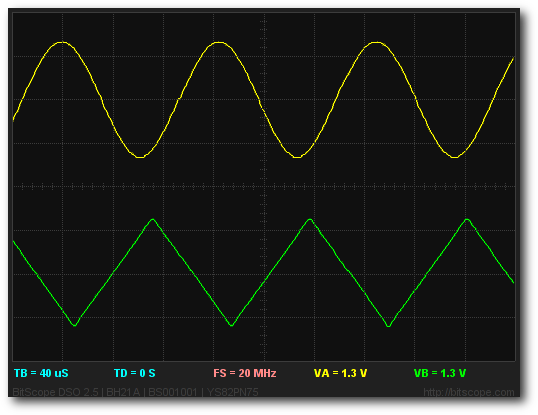 This example shows an 8 kHz sine and triangle waveform, sythesized by Pocket Analyzer's waveform generator and sampled at 20 MHz via its two analog inputs using BitScope DSO. Like a regular oscilloscope, Pocket Analyzer and DSO provide familiar trigger, timebase and voltage scaling and offset controls with display refresh rates up to 100Hz. Of course Pocket Analyzer is a BitScope so it also has 8 logic channels in addition to the analog channels. Below an 1 kHz sinusoid generated by a microcontroller in 32 steps is shown with its analog output via an 8 bit D/A. The logic channels show the D/A input (digital signals) and the analog channels show the op-amp buffered D/A output and its inverse. 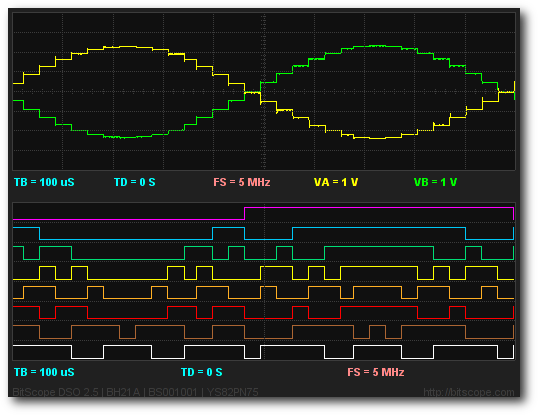 This app is similar to DSO's mixed signal instrument but offers full protocol packet decoding and display. 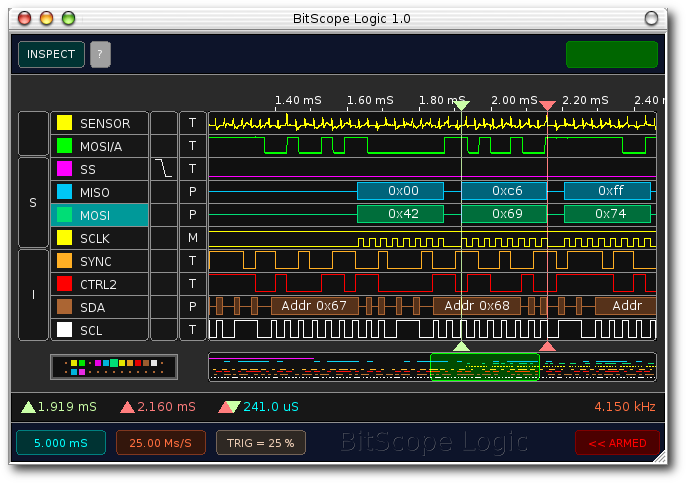 BitScope Logic and Pocket Analyzer can display decoded logic on an ongoing basis live as it's captured, frame by frame (unlike any other pocket sized analyzer we know of). BitScope 10 has a massive analog bandwidth for such a small product and this can be used to good effect via the sub-sampling modes of BitScope DSO. Sub-sampling is a powerful analysis technique for periodic waveforms. It is supported by BitScope 10 because its A/D is extremely fast (3ns aperture). Signals up to and even beyond 100 MHz can be displayed with equivalent time sample rates beyond 2GHz so long as the signal is periodic and has a frequency, amplitude and harmonic structure which does not change rapidly for the duration of the sub-sampled capture frame. Pocket Analyzer inherits BitGen Waveform Generation features of BS120. 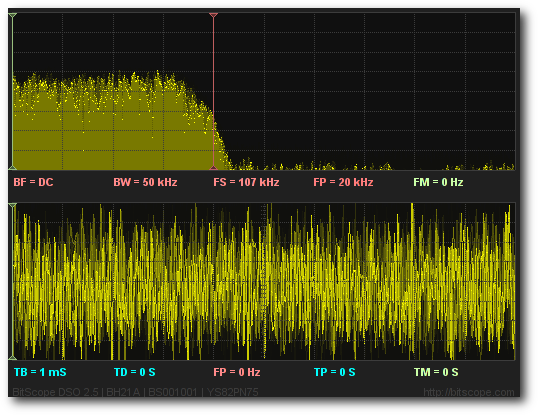 Pocket Analyzer can be used as a powerful real-time mixed domain (time and frequency) spectrum analyzer. It can be used in baseband or narrow band (RF) applications. 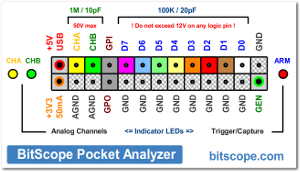 The examples above are just some of the test and measurement possibilities available because despite its tiny size, Pocket Analyzer is a fully featured BitScope!